So this morning I woke up to find out that an old co-worker of mine had passed away. My first job right out of college was working as a copy editor for Wizard Entertainment. I got to write, edit, and proofread articles about comic books. Pretty cool job. Besides the perks of free comics, one of the best parts of the job, I have to say, was the staff. The editorial, design, and research teams were a close-knit group of guys (and a gal or two) in their early 20s. It was pretty much like a frat house, everyone playing practical jokes on each other and slinging insults left and right. Yeah, you needed a pretty thick skin to survive in there. Yet despite all that, we managed to put out some pretty cool magazines every single month all about comic books, collectibles, and pop culture. When I started at Wizard, my desk was right next to Marc Wilkofsky. He was and will forever be the oddest, strangest, quirkiest person I have ever had the privilege of knowing and working with. I could write a book or three chock full of Marc stories, but unless you know the guy, it just won’t have the same effect. Heck, you’d probably think I made most of them up. In a building full of guys who love comic books and video games, Marc loved soap operas. He was a huge fan of Mary Chapin Carpenter and other country music. And yes he loved him some comic books. His favorite? Wonder Woman. But all of that is just personal interests. Marc was a TV sidekick in the flesh. A real-life Kramer. Ed Norton. Or Raymond’s brother (whatever his name is). Marc was known for his constant “Yup, yup” and “Oy.” He was kooky. He was zany. He could just make you completely crack up and lose it with his off-the-wall zaniness. Above everything else, though (and Marc was an excellent copy editor, to the point of perfection at times… which was painful when you’re on deadline), Marc was an incredibly kind soul. I don’t think he had a bad bone in his entire body. I never heard him say one bad thing about anyone. He always saw good in all. Always was there with a smile, a word of encouragement, an infectious giggle. I haven’t spoken to Marc in years, but he most definitely had a profound impact on my life. He didn’t just teach me about copy editing; he taught me some great life lessons. Be true to yourself. Don’t be afraid to be different from everyone else. Just be yourself and shout it to the world. There’s a bit less zaniness in the world today. A few less oys and not nearly enough yup, yups. You will most definitely be missed, Marc. But at least we know there’s going to be a lot less typos in Heaven. 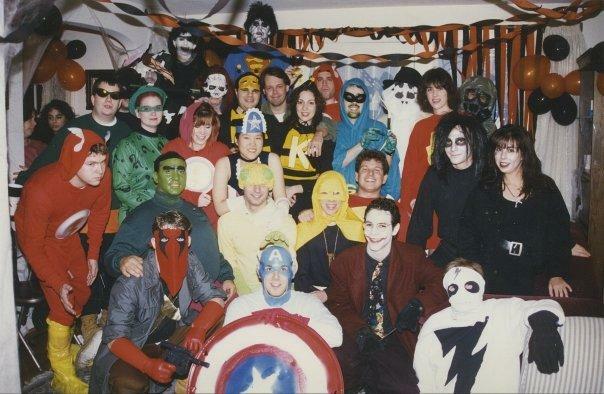 The first Wizard Halloween Party. That’s Marc just off center as the Green Arrow. If you knew Marc, please share your thoughts, favorite Marc moments, whatever in the comments below. Well, I didn’t meet Marc Wilkofsky or anything. I just started to google for the whereabouts of some of you, classic Wizard TGTC staff members and the first name it came to my mind to google was Marc’s. Because of the Wizard bullpen bulletins we learned about Wilko’s appeearances in Tempest’s show, first as a “wimp” and then as a blind date, booging all his way to the set. I also remember the infamous Wizard vs.Toyfare war. I think that was the time when Marc’s chair was put upside down, along with the rest of the Wizard’s office furniture and the sweet revenge of saran-wrapping everything in Toyfare’s office. I’m really sorry to know Marc has passed away, but I’m glad to hear the rest of you ex-Wizard staffers are doing good. In the name of the thousands of now grown-ups whose lives you lighten-up a bit in a montly basis, Thank you. Marc was a long time supporter and a volunteer (for at least 10 years!) at our annual Parkinson’s Unity Walk in New York’s Central Park. One of his fellow volunteers told us about the news and we are saddened to hear about his passing. He is part of the Walk’s history, from its initial stages and as it grew over the years, he continued to stay with us. He was part of our PR committee many years ago, and yes he helped to edit our event brochures and materials. He even came up with one of our earlier event taglines. One of my favorite memories of him was when he showed me a comic strip he drew about the Walk, he was definitely passionate about doing everything he can to help out! Here’s a photo of Marc volunteering at the Walk it was a cold very early day and he was there to help out! My colleagues and I join all of you in remembering Marc. Can’t spell my own name. Somewhere, Marc is having a fit. Thanks for sharing, Phyllis. I definitely remember his Oscar pools and his love of ER! And you are sooo right that he’s having a fit (and a laugh) right now at you misspelling your own name. I knew Marc for many years-almost 19, to be exact-but not in a work context. We were friends having met in a forum about the show ER. Over the years, he was my constant companion when there was an awards show, and he would arrive at my home with his newest work, and award show pools. We shared job changes and life changes ove rthe years. I enjoyed reading all these anecdotes about Marc. He had many sides and different aspects to him, but I know that no one knew them all. I miss him terribly. Marc stories almost always revolve around his nature, which was to be true to himself…regardless of how he would be perceived. He would sometimes blurt out something completely absurd. Other times he would get himself into situations that normally only happened on sitcoms. Still, the most important aspect of his nature emerged when someone else needed something. He was usually the first in line with words of condolences or an offer to help. He was truly compassionate, thoughtful and courageous. A story from a very early Philly convention where he and a few other Wizard guys were in an elevator with a handful of regular people. Marc couldn’t deal with the silence so he blurted out, “I never laugh anymore”. In a confined space like that, to strangers that pretty much conjured images of a Mark David Chapman moment. They didn’t understand that it was just Marc trying to connect with others regardless that he was messing with an unspoken social rule about talking in elevators. Another time, as was common in a primarily 20-something male-dominated workplace, conversation revolved around passing gas. Marc’s contribution was, “I haven’t farted since 7th grade.”. The context was later revealed that he meant that he hadn’t done such a thing in public since 7th grade mostly due to social propriety, but at the time it got some pretty good laughs. I’m sure others or the infamous “Quote File” can recall many more Wilkofsky witticisms. As for situations, Marc all too often would get himself into situations worthy of an episode of “Seinfeld”. Who could forget when Marc once climbed on top of his desk for some reason and then couldn’t figure out how to get down. It was a moment of pure Marc. He was the youngest little old man I’ve ever known. Or when he neglected to sunblock his ankles in January on a trip to FL and he got 2nd degree burns. Or his demo country music song that he shared, “And She Dances”. Then there was his ever popular appearance and subsequent reappearance on the “Tempest Bledsoe” talk show. There are so many more and each are indelibly etched into the minds of those who witnessed them. I used to worry about Marc allowing himself to be put into situations where he would be mocked. Don’t get me wrong, the Wizard office was a place where everyone got teased, but it wasn’t meant to be cruel. It was like being in a family. Everyone who was part of the family got picked on and teased, but if anyone outside the family tried it, they would bring down the wrath of the entire clan. I was concerned for Marc that people outside the office would be mean to him because of the things he was passionate about-his dancing (which was a sight to behold) or his loves of singing, Wonder Woman and soap operas. My thinking was that he should try and be a little low key to avoid drawing that negative attention. He could not do that. I saw people be mean and he just didn’t let that stop him. He remained true to himself and by doing so showed me how brave he really was. It took me a while to understand it but there are times while I was growing up that I wish I had more of that kind of courage. I feel I missed out on some kinds of opportunities that Marc never allowed himself to miss. I am still shocked by his passing. We would occasionally message on FaceBook over the years, but he was such a legendary figure at Wizard that he will always be someone featured fondly and prominently in my memories of that place. A kind gentle and brave guy who, while quirky and often unintentionally funny, touched so many and he truly left his Marc on us. RIP, Wilko. Thanks for the comment, Steve. Really beautifully put. You said it better than I did, and I’m supposed to be the writer. I most definitely remember the insane time he was on his desk hanging up a poster and he just couldn’t for the life of him figure out how to get down. It literally took him 10 minutes, and that’s with me and another office mate helping out. There was also the time someone turned his desk chair upside down. And yeah, it took him about 5 minutes to figure out how to best turn it back over. He was nothing, if not entertaining. Gotta love the guy. Amen. A wonderful eulogy, Steve… and a reminder to us all about Marc’s life lessons in marching to one’s own drum. Scott Beatty recently posted..JUDGMENT DAY… March 20, 2013! That was perfect Steve, thanks for that. I didn’t fully appreciate what a great person he was when I was at Wizard (I once paid Arlene 10 bucks to steal all of Marc’s red pens during a particularly stressful deadline crunch hoping it might slow down his lightning-fast copy-edits – after a few minutes of Wilco-esque confusion he just stood next to me and cheerfully dictated the edits over my shoulder) but in the years since bumping into him at MoCCA and various comic functions and catching up was always a highlight. Still in shock that he’s gone. Oh my god. I totally forgot about the pens. Indeed Steve, wonderfully put. Marc was a great guy. He was someone who asked how you were doing and really cared about the answer. He was smart, gentle, and really thoughtful. I’m sad, but also really glad that I got to know him. And Buddy, I’m sure Marc would be the first one to say the same thing about you. He really was glad to meet anyone and everyone. Thanks for sharing your memories. Marc was also a constant positive influence on my life and I will never forget him. I’m so sorry for the loss of your friend and co-worker. It is never easy to say goodbye, no matter how long it’s been since you’ve been in touch with each other. It sounds like you will always have great memories to see you through! Marc was such a sweet, kind guy. This is really heartbreaking. Jesus. Sorry to hear. And yes, in true Marc fashion: “Fewer” typos. So shocked and saddened to hear this. Remembering the “yup yup” makes me smile even now. I catch myself doing it from time to time to this day. Rest in peace to a smart, funny, kind soul. A year ago, he dropped me a line through LinkedIn and because you can never take the copy editor out of him, kindly corrected something on my profile. I smiled and replied on how his red pen was never far. Another memory that stayed with me was his parents. After my first day at Wizard at the Chestnut Ridge office, I was waiting outside to be picked up by my father when i came across his parents waiting for Marc. They asked if I worked at Wizard and when I said yes, they were beaming because their son was an editor there. He made them so proud that it had a long lasting effect on me. Marc was one of a kind and we’ll all miss him. That’s awesome. Thanks for sharing, Leenie. As the third WIZARD copy editor hired (after Marc and Andrew), and having shared an office with both for a short time, I knew Marc as a shy and kind soul. I remember how sad he was when he left WIZARD, and I admit to Googling his name a few times over the years to see where he ended up. When I saw that he was working for SOAP OPERA DIGEST, I smiled… knowing his passion for the soaps. His passing is very sad news for both his close friends and those of us who knew him just briefly but remember him well. 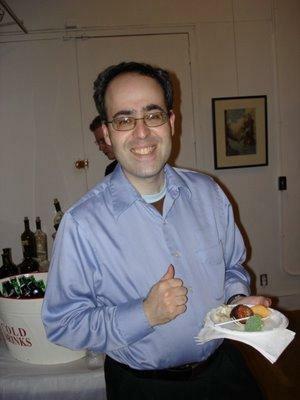 I just hope that Marc can see all us WIZARD bullpen vets assembled on Facebook and via email reminiscing over him with our shared “Yup-yups.” Rest in peace, Marc. “A lot less typos in Heaven.” I believe Marc would strike that and jot “fewer typos” in the margin in his trademark scrawly cursive. Yes, yes he would. In red, of course.